There are two worlds of Barbecue lovers. One world loves heat. One world keeps it cool. Here’s a quick barbecue trick that tempers or livens up the heat in your next sauce or salsa or whatever you’re cooking up with high octane peppers. Lets start by saying there’s no taming peppers like habaneros or scotch bonnets. Scoville units measure the amount of capsaicin in a pepper and habaneros are in the 100,000 to 300,000 range. A lot of capsaicin is in the white “core” or membrane of the pepper. y scooping out the seeds and white center of the pepper you can cut down the intensity. Still Too Hot? Another tip is NOT to slug back water to cool off the heat. That will just spread the fun. Milk or Yogurt coat the mouth and that can help slow and block some heat. A good chew of something bland like break or rice can also help pull away the pain. Worth noting the pain in your mouth is much more pleasant than the burn of other tender tissues. Wash your hands whenever handling peppers. The oils are there even though you may not see them. It’s great to get to know new fans of barbecue and all types of food. Blogging seems to be a great way! Hello to my new friends joining in from the Great Cooks BlogRoll and SimpleDailyRecipes.com. Recipes look pretty budget friendly! Explore their sites and you’re sure to find some good eats. North Carolina and South Carolina are an odd pair. Yankees almost see the duo as the same State… “Carolina.” But there are differences… especially when it comes to barbecue sauce. It’s somewhat regional but everyone has his or her own favorite. Up North East they like a close to pure vinegar version of an ultra thin sauce. I’ve even seen it clear (although usually using cider vinegar). South Carolina has it’s hands in different styles… but their claim to fame (thanks to Maurice Bessinger and family) is a tangy sweet mustard based sauce. In the Piedmont area… or out West it’s also vinegar. But there’s a good squirt of tomato or ketchup in the mix. 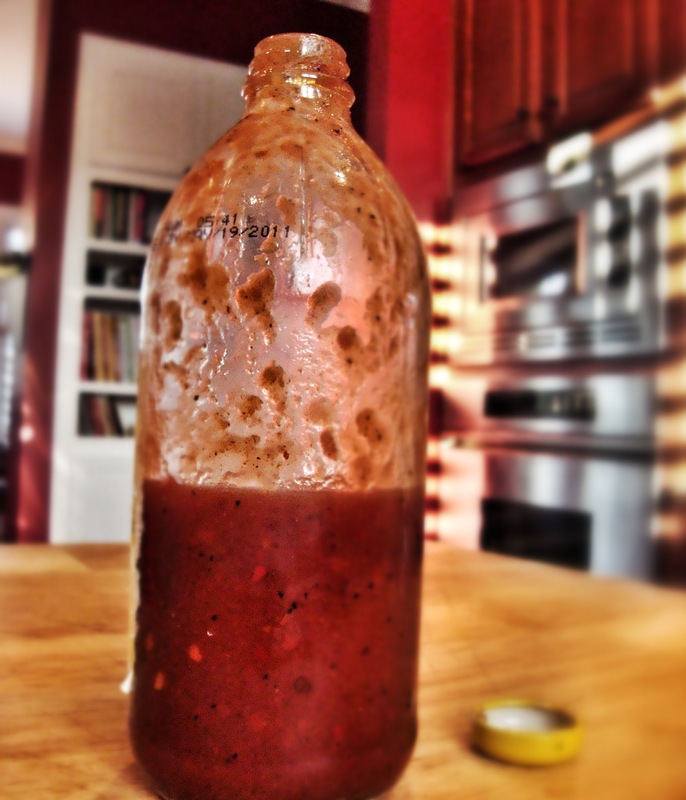 Here’s a Barbecue Tricks version of a Western Carolina Vinegar sauce. Tart, hot and a bit sweet but thin enough to mix quietly into a pile of pulled pork without getting in the way of the smoke in the meat. A Western Carolina favorite. This tart and tangy vinegar sauce is thin but bold. I like to pick up a full 16oz. bottle of good cider vinegar for this sauce. 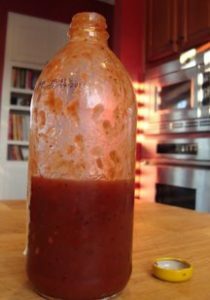 Get it in the glass bottle so you can funnel the finished sauce back in. Get a good sized kitchen funnel. You'll have some vinegar left... so you may choose to double the amounts and make extra sauce to serve and have a full bottle to save for later.